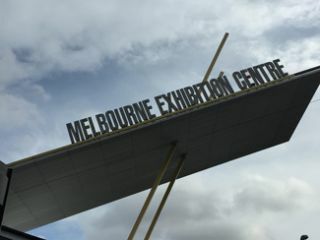 Melbourne, Australia, home of Integrate Expo, is the future; or at least it is in the future, as in 14 hours ahead of New York, 17 hours ahead of California. I've been here a few days and still don't know what time it is exactly, or when I should go to bed. I'm here for Integrate, an audiovisual trade show put on jointly by InfoComm and CEDIA. It certainly has the feel of an InfoComm show, but is considerably smaller — both in terms of size and number of exhibitors. This is my first time at the show, but the basic premise is the same: people from multiple continents descend on a centralized location eager to see the latest and greatest in the pro AV, residential, and automation technology space. Here's how it shakes out. All the big players are here: Crestron, Extron, AMX, Samsung, Sony, Canon, Panasonic, and Epson all have stands (they're not called booths here — that's been difficult to get used to). Many of the other InfoComm and ISE heavy-hitters are co-spacing with their distributors. For instance, Midwich Australia has Chief, Da-Lite, Mersive, BrightSign, Haivision, Atlona, Vaddio, and several other exhibitors all within its booth. That seems to be the main difference, for me, is distributors are the main draw here — fewer companies with their own booths (fewer booths overall), but there's still a quality representation of the industry thanks to the distributors. It also creates a different dynamic, as I on occasion reference products distributed by a competitor, but all these things are easy to overcome. From the myopic viewpoint I have, it seems to go without reason when items are damaged, or not working properly, one calls tech support, a new unit is sent out, or a return-for-repair request is initiated. Unfortunately, it's not always that simple for international customers, as often the most frustrating choke-point to quality international service is shipping devices from out of country and dealing with customs. I've already answered more questions about how my company supports their [international] customers in the last few hours than I did for the whole of InfoComm, really reminds you to Rethink Support as Sales. Since Integrate is a significantly smaller show, I was able to see more of it than I was at InfoComm. Here are some of the products that caught my eye on the show floor, the majority of which were exhibited at InfoComm, some of which were not. Silicon Core LED Panels - these impressively bright (2,000 nits) panels were eye catching not only due to their monstrous size, but also their incredibly small pixel pitch. Their Lavendar solution, which maxes out at 1080p, has a 1.2mm pixel pitch offering stunning clarity, while their Magnolia panel offers UHD resolutions with a 1.5mm pixel pitch. Quite a beautiful display. SMART 6065 - a truly interactive whiteboarding solution for collaboration. I'm not a huge fan of their Kapp systems overall, as the majority of the Kapp line offers one-way "collaboration," this one allows up to 250 participants collaborating, real time, on the same whiteboarding session, with real-time capture and share options available for drawing revisions, et al. A marked improvement. Crestron RL2 - I'm sure by now that everyone is aware of the RL2 system from Crestron. They showcased it at InfoComm 2015, and by all accounts there was an exceptional response to it. This was the first chance I had to take a look at it, and I loved it - simple and easy to use, a complete solution for Skype4Business conferencing. There is a small webcam included in the package, but that can be upgraded to a higher-performing camera for applications needing it. I happen to know for a fact the Vaddio RoboSHOT Q-USB system is officially supported. Extron MediaPort 200- Extron is officially in the game for soft-conferencing interfaces. They have quite a robust audio and video USB interface. This device ingests high-definition video and audio and creates a USB 2.0 stream to PC for soft conferencing. Extron also showed its newest addition to the product family, the CCI PRO 700, a control interface optimized for conferencing, collaboration, and AV control. Integrate has been quite the experience thus far. It's been incredibly beneficial to be able to walk the show floor in its entirety and have some good conversations with some of my partners, an opportunity I wouldn't be afforded at some of the larger shows. Mike Brandes is a former university technology manager and currently an applications engineer for a leading AV manufacturer. Follow him on Twitter @MikeBrandesAV or his personal blog mikebrandesav.com.